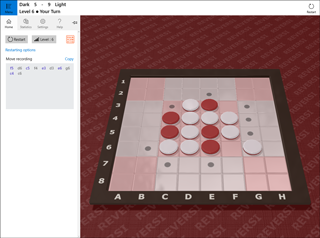 The app's main view displays graphical reversi-board & pieces, and some controls ("Menu" button to open sidebar, information about current game and "Restart" button). In your play-turn, choose a move by touch, mouse or keyboard as follows. By touch/mouse : Tap/click on the target square to put your piece on it. By keyboard : Move cursor to the target square by arrow keys and hit space to put your piece on it. You can put a piece only in legal position (indicated by small disc guide marks). When there is no legal move available, you automatically "Pass" and play turn switches back to the opponent. *If there is an ongoing game, you give it up and start a new game. All the moves players make are automatically recorded in common format. Show guide marks : Turn on guide marks to indicate squares on which you can put a piece. Sound effects : Choose "Percussion", "Snap" or "None"